Until a few hours ago, I thought Christianity's killing was all in the past. Christian thinkers continued to justify the killing of heretics and unbelievers throughout the Medieval Period. Science itself was considered a forbidden sorcery - look back at Copernicus and company. The role of "Christians" in the week long genocide of up a million Tutsi in April 1994, always shocked me. I knew there was a horrible historical feud between the Hutu's and the Tutsi. That tribalism and ancient ethnic cultural hatreds were to blame. This was much about power and control but until today, I had never considered for a minute that Roman Catholic clergy - bishops, nuns and priests could be culpable of atrocities. I remember the images of the slaughtered inside churches where they had taken refuge and their bodies burned in the courtyards. It was all in terms of a two tribes going to war. I did not realize that the country was 90% christian. 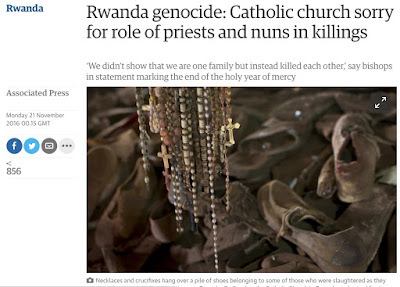 The RC Church in Rwanda has apologized for the church's role and the actions of those who participated in the massacre. According to survivor accounts many victims died at the hands of priests and nuns! Horror of horrors. Victims sought refuge in churches and were slaughtered by and at the direction of clergy! Not minimize the abuse scandals that have rocked the church in the Western World - but what the hell? Churches as extermination centers? The UN's International Criminal Tribunal for Rwanda has issued charges against former Rwandan clergy who were smuggled out of the country and quietly hidden in monasteries in parishes in Europe. 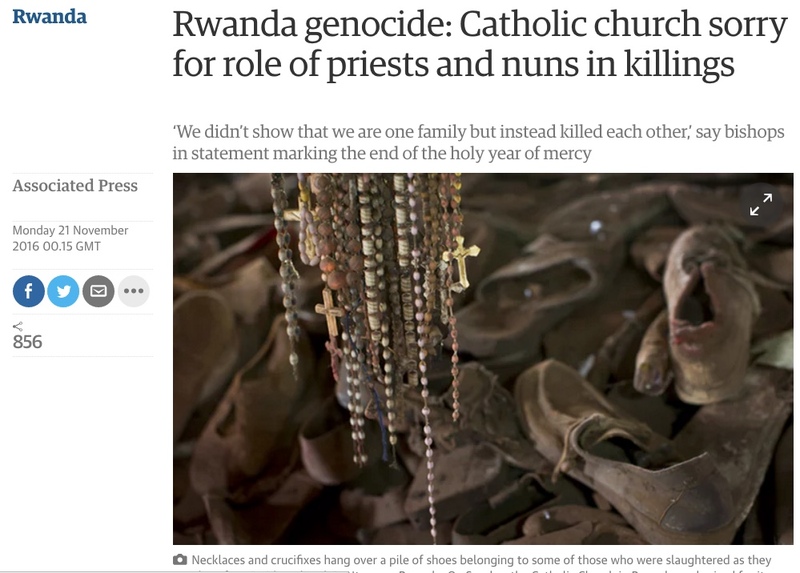 Virtual catalogues of horror attributed to Hutu clergy. - even against hundreds of Tutsi priests and nuns. Amonst the hidden was one Father Athanase Seromba, who was given a life sentence in 2009 involvement in the killing of 2,000 Tutsis at his parish in western Rwanda. He was found ministering under an assumed name at a Catholic parish near Florence, Italy. He had ordered the bulldozing of his church with 2,000 Tutsis inside. There is no evidence that the Vatican ever helped them escape justice but their friends in the church did and that really saddens me.